The e-tailer's revenue totaled $61 billion in 2012 and it currently sits at No.5 on ComScore's list of top 2,000 domains on the web. Bezos chose Amazon.com for two reasons: one, to suggest scale (Amazon.com launched with the tagline "Earth's biggest book store") and two, back then website listings were often alphabetical. Amazon's warehouses have more square footage than 700 Madison Square Gardens and could hold more water than 10,000 Olympic Pools. The first book Amazon.com ever sold was from Bezos' garage in July 1995. The book was Fluid Concepts & Creative Analogies: Computer Models of the Fundamental Mechanisms of Thought. Amazon's current logo was designed to depict a smile that goes from A to Z. "This signifies that the company is willing to deliver everything to everyone, anywhere in the world." Amazon.com employees spend two days every two years working at the customer service desk, even the CEO. This practice is to help all workers understand the customer service process. Amazon owns 10 percent of North American E-Commerce. Office Depot, Stapes, Apple, Dell, WalMart, Sears, and Liberty all own another 10 percent of the market, the same size as Amazon. That leaves 1,000+ retailers to all fight for the remaining 80 percent. Last year, when Amazon's site went down for 49 minutes the company missed sales of nearly $5.7 million. Greg Linden a former Amazon employee who invented the recommendation engine described Amazon's initial frugality. Linden writes, "the quintessential example of Amazon's frugality was the door desk. Leave it to Jeff Bezos. Buy a wooden door, preferably a hollow core wooden door with no holes pre-drilled. Saw a couple 4" x 4" x 6' pillars in half. Bolt them to the door with a couple of scary looking angle brackets. Put it in front of a programmer. Door desk." Amazon's unique users are 5x more valuable than eBay's. Amazon's average unique user brings in about $189 while eBay's brings in just $39. In 2009, Amazon.com bought popular online shoe retailer Zappos.com in an all-stock deal worth about $1.2 billion. 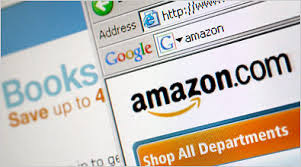 Amazon.com is well-known for its Kindle, lightning fast shipping, and selling virtually anything online. Amazon.com was almost called "Cadabra" as in "Abracadabra". That idea was struck down because CEO Jeff Bezos' lawyer misheard the word as "cadaver".